Saturday 11-5, Sunday by appointment, Closed Monday, Tues-Thurs 11-5, Friday 1-5. 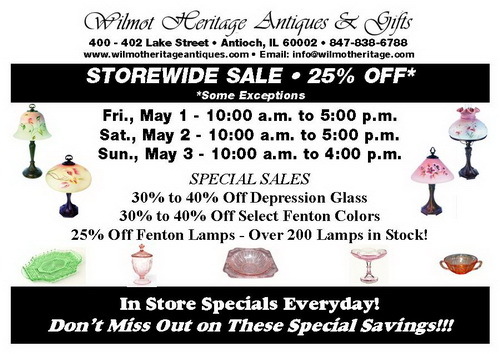 One of the largest dealers for Fenton Art Glass, old and new, in the Midwest. Aladdin Lamp dealer, Peggy Karr glass, Blenko Glass, Byer's Choice, Warm Glow and Thompson's candles. Depression Glass, Furniture from the late 1800's to the 1970's. Wood Graphix wall art and 3-D Birch Lake Maps.